Forget genetealogy. 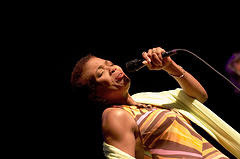 Jazz singer Dee Dee Bridgewater found a way to trace her African ancestry without swabbing her cheek or spitting in a cup. The same thing happened to me! I wasn't sure of my Finnish heritage until I heard this. I'm worried. What does it mean for my genealogy if this is the music which speaks to me? Are any of your ancestors from Dalmatia? Or perhaps from Chihuahua?